Still, the De Jonge Family has strong ties with the Netherlands. On the stoop in front of their house they keep a pair of wooden shoes. Inside, embroidered images of Dutch church towers adorn the walls. Out in the back, De Jonge’s barbecue has a large cooking plate for ‘poffertjes’, little Dutch pancakes. Coffee is served in mugs with traditional Dutch school images. Moreover, the couple stays well informed about what’s happening in the Netherlands. In the past, they read magazines and newspapers, or heard the news from their contacts back home. These days, it’s even easier, with the Internet and satellite TV. Effortlessly, he names prominent Dutch politicians, from Balkenende to Marijnissen to Wilders. “And then you had that woman at Immigration, the former prison director,” he says. De Jonge would likely perform well in ‘Stop the Time’, a new quiz show at BVN, the public television station for Dutch speakers abroad. In it, Dutch migrants who have been away from the Netherlands for at least 25 years are quizzed on Dutch events of the past decades. They are also asked for their assessments of modern Dutch society. 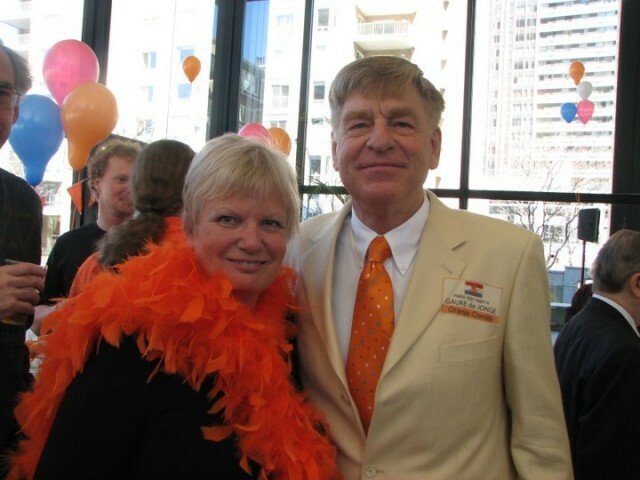 Ineke and Gauke de Jonge during a reception for the Dutch community in Montreal to celebrate Queen’s Day. Canada has been one of the main destinations for Dutch immigrants since the Second World War. According to statistics from Radio Netherlands Worldwide, there are 358,000 Dutch people in Canada, of a total population of 32 million. That’s more than any other country (Australia is second with 230,000). Dutch immigrants to Canada have traditionally been known as hard workers who are keen to integrate into mainstream society. Elaine Herfst is an example. In 1957, when she was 17, she immigrated to western Canada with her parents and siblings. She now lives in Chilliwack, British Columbia. She prefers to speak English. Although she describes her immigration experience as initially “traumatic”, she would never want to return permanently to the Netherlands. Gauke de Jonge feels strong ties with both Canada and the Netherlands. “We are well integrated here, but if I look at myself, I have also remained a Dutchman,” he says.